I don’t think any of us got more than a couple of hours sleep that night but after a quick coffee and final pack we jumped in a taxi for the bus depot. 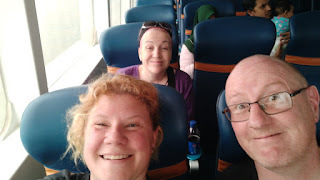 It was about 5 hrs to the ferry port at Tanjung Gemok, but the bus was really a luxury coach and we’d booked the front seats again so Jane and I managed to snooze in air-con recliner seats for most of the journey. We’d picked the ferry that left from Tenjung Gemok due to better online reviews and travel times but we still had a couple of hours to kill once arriving at the port. It was very quiet when we got there and after paying the standard National Park entrance fee for Tioman we settled ourselves in the large waiting area. The peace was shattered shortly after as about 30+ English speaking young teenage school children arrived to take over the area. They weren’t there long but it made amusing and horrifying spectator sport as they formed little clichés and tested the patience of their teachers, before heading out on their boat. Looked like they were in for an amazing school trip wherever they came from. 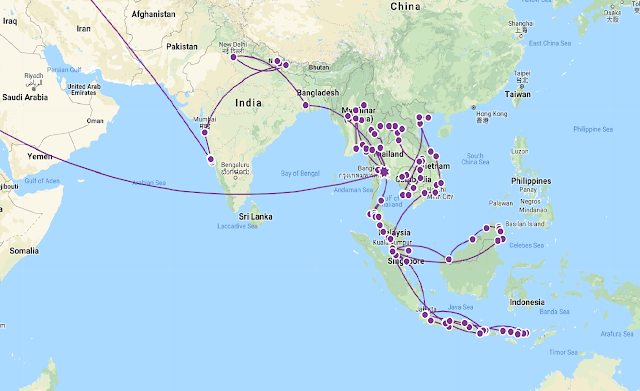 The boat journey was an uneventful 2 hr trip, in which they showed one of the family friendly Resident Evil films in the main seating area – there doesn’t seem to be a watershed for films in public areas anywhere in Asia. 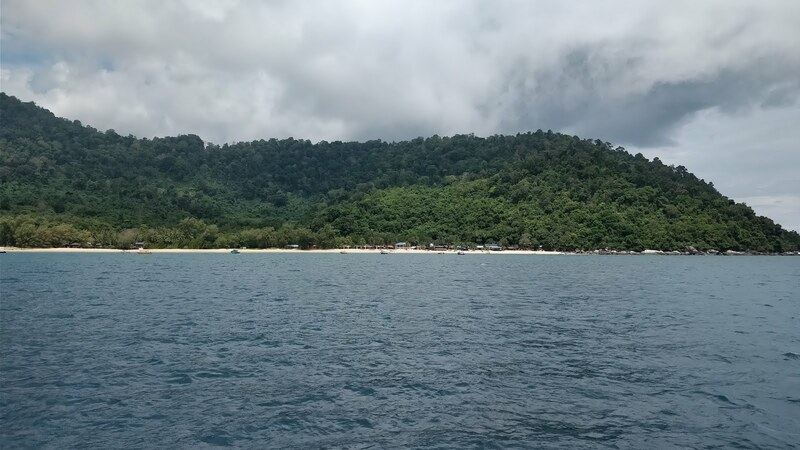 Arriving at Tekek, the 3rd stop on Tioman island, you find yourself looking at crystal clear water and an island covered in lush green jungle. There isn’t much to see as you get off the boat. There were a few restaurants by the port and one road leading off in each direction. 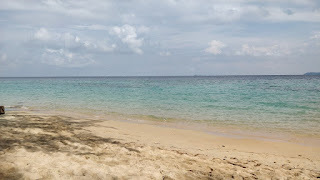 A 10-15 min walk along this road and we arrived at Swiss Cottage Tioman resort. 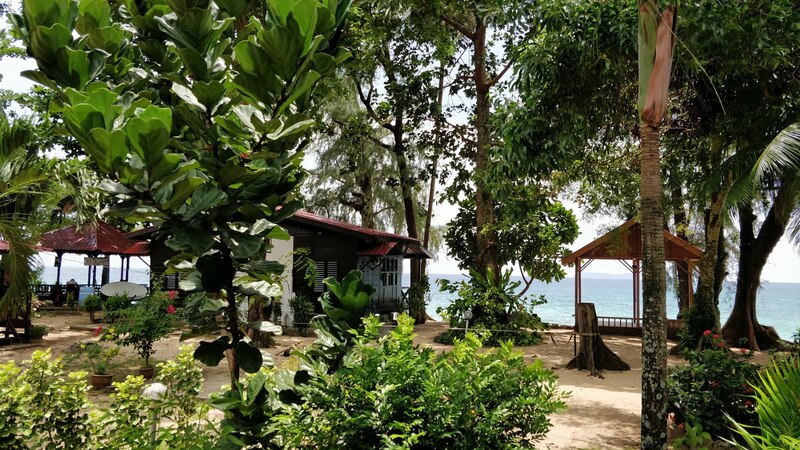 This is a beautiful resort with wooden buildings nestled in green gardens and glimpses of a white beach a few feet away. The rooms were spacious and all had a balcony seating area, plus there was a large communal seating bit with games, books and access to an honesty box cold drinks fridge. The resort is also home to around 13 rescue cats, some very friendly and eagerly seeking laps, whilst others were happy just to sleep on your balconies, breakfast table, pathways or anywhere that took their fancy. Paul and I had decided to see if we could cope without aircon in a beach front bungalow, but what we hadn’t realised is that this room had completely open ventilation widows for all the mosquitoes and bugs to get in as well. We trialled it for one night but after being eaten alive that first night we changed to a terrace aircon room (these all had mesh over the vents and windows), which only added about 20 steps to our beach commute but halved our total accommodation cost. The reason we’d booked Tioman Island was because of the snorkelling it offered straight from the beach – they even have a good dive school located on their premises. We didn’t swim that afternoon but relaxed and went for a wander to check out the local restaurants. Tioman is a duty-free island, so we’d passed a couple of duty free shops, another couple of resorts and about 4 restaurants on the walk here. If the restaurant doesn’t sell beer they normally don’t mind you bringing your own, and at 70p a can of beer or just over £1 a bottle of cider that’s what most people do. The first day we had a lazy day on the resort beach, swimming on the house reef and learning the tides for the best / safest swims. It was amazing the amount of different fish, rays and corals we could see only a few metres from our rooms. It gets very shallow near low tide and Jane had to tell some people off for standing on the live coral shelves but in general there weren’t many people sharing this oasis with us. We also spotted a Monitor lizard strolling through the gardens, and we’d been warned not to leave things out as a troop of monkeys lived nearby and often raided the balconies. It was after this day on the beach that we noticed some oil spots on our feet and assumed that this was because we’d swam near the boat lane for the scuba school. After Jane went for a beach wander to investigate what she discovered was that the tiny black pebbles on the shore left by high tide were actually little nuggets of oil. Further up the beach these had joined up to form little slicks. The dive school was closed by this time so we had no-one to report to and no way of clearing this up ourselves so had to leave it until the following day. We also spotted a rather sickly-looking ginger cat, that looked like he’d been playing in this oil and had it all over his paws and face. After much discussion with the owners and staff we were informed that he was very old and currently being treated for a skin infection as well as recovering from horrific cuts and wounds. We nick named him Ed Shereen cat (or scruffy) and kept a close eye on him throughout our stay but he didn’t get any worse, so I assume he’ll pull through. The next day I woke up feeling rough and full of cold, but we’d booked what was supposed to be a shared snorkel trip around the island. I also went down to see if our oil was still present on the beach and although a couple of tides had dispersed it, it was still there. I told the Dive school, who were very concerned and said it wasn’t normal and they would report it to the reef watch team. We got picked up for our snorkel trip and fortunately for us as no-one else had booked that trip with that company it was just us 3 on our own private charter. We were meant to go to 6 different locations but with the seas very rough at Malang Rock our guide said it wasn’t safe to swim or anchor the boat. We still saw 5 other locations all with beautiful coral beds and shoals of fish. The dead and bleached coral surrounding the live coral is very evident and you have to wonder how much longer we have to enjoy these underwater gardens but there is also a lot of life there. We all agreed that the best place we visited that day was Renggis Island, which we could see from our resort but was too far to swim to. It’s a tiny uninhabited rock surrounded by shallow reefs and wreaks that the scuba schools visit. The fish there were phenomenal and we even saw black tipped reef sharks lurking in the shadows. Some of the fish have gotten used to being fed which meant that we all received some nibbles as they tested to see if we had anything worth eating, especially as we had been collecting bits of plastic as we swam round the rock so must have looked as if we had food. The highlight of this site for me was a massive shoal of little green / rainbow /iridescent fish that swam close to the surface so literally surrounded you as you floated amongst them – there were thousands of them. We tried to get pictures with an underwater camera Jane had bought but it really doesn’t do it justice. After about 5 hrs snorkelling I was shattered plus my cold was turning into a fever and I was glad to be back in an air-conditioned room. The next day I was feeling rank and so stayed in bed trying to sweat it out, the others both had a touch of sunburn from the snorkelling trip so it fitted with another lazy beach / resort day. 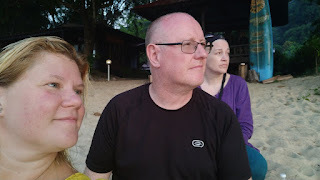 We’d been very lucky with all the restaurants we’d tried, and although we were tempted to get the expensive water taxi to the busier beach for the evening we decided against it and ate local every evening. 4 days flew and before we knew it we had to leave our little paradise which also sadly meant saying goodbye to Jane. It had been so nice having another person around to chat to and remind us of all our friends back home. The boat back to the mainland was easy and once back at Tenjung Gemok Paul and I had a 5 hr wait for our bus to Singapore and Jane had a couple of hours before her bus back to KL. Just as her arrival had brought tears of joy her departure brought tears of sorrow and we made her promise to visit again as soon as she could. It had been amazing having a friendly face there with us and saying goodbye made me extremely homesick. But with Singapore fast approaching we couldn’t afford to wallow in sadness for long.